Remove all cards from the layout by pairing them with another card to reach the combined value of 13. Tap one to highlight it, then tap the second to clear both cards off the layout. Kings do not need to be matched and are removed simply by tapping them. If a card you need is underneath another, you can move the card on top to the Card Store by highlighting it and tapping the Card Store. Please note, the Card Store can only hold a single card which needs to be paired to clear the Card Store again. If you can't find a pair, tap the card back to add three cards from the deck to the game. You can do that at any time until the deck runs out of cards. If you succeed in clearing all the cards, the game will continue to a new round and you will carry over your score. The more rounds you manage to string together, the higher your score will be. Auto Hint is an optional play assistant that is designed to gently guide you towards your play options. When selecting a card, Auto Hint will point out which cards you can use for a match after a short pause. If there are no possible matches, Auto Hint will not disturb your play. You can toggle 'Auto Hint' on and off in the Options Menu, accessible from the Main Menu or the Pause button. Time Bonus = Bonus points for finishing a round quickly (as shown on the game board). Please note, when using the WIN ROUND option, the only bonus that is paid out is the Round Number Bonus. 'Score Build Mode' is a player aid that when active will carry over your score from the last game, but only if you had a bad round and didn't make it into the Top 10 scores. When active, the 'Score Build Mode' option carries over your score into the next game, until you have built up a score high enough to displace a score on the table. If you scored well enough to make it into the Top 10 the game will score normally. 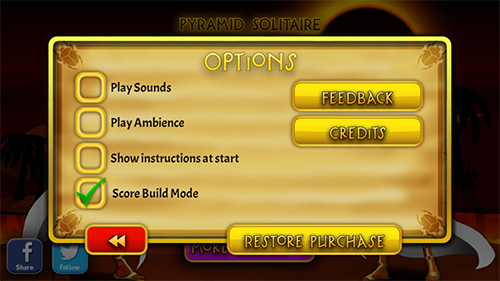 You can activate 'Score Build Mode' in the Options Menu. Always remove Kings as soon as possible, they literally just get in the way. Try to plan your moves. Look at the board and see what cards are blocking other cards. You absolutely must use the temporary card store. Combine that with planning and you can win most deals. Often simply by moving one card from the pyramid down to the store you can instantly uncover another card that you can use immediately. This almost a bit of a cheat (so let's just consider it an expert tip!). You can use the undo card to look at the next 3 cards coming. This will allow you to plan your moves more effectively. There is no penalty for using the undo card. At the bottom where the groups of three cards a dealt, if you have too many cards the game will hide them to save space. Those cards are always there, just hidden! Remember you don't have to remove every card, just the pyramid at the top. We are sorry to hear that you are unhappy with the updated version of our game. We recently released a huge update, mostly because we had to, but also because we believed we could make the game much better. Fact is, the old version was rapidly ageing from a technology point of view, severely limiting our options in terms of what we could do with every new version of iOS. Apple is modernising their software on an annual basis – e.g. the move from 32-bit to 64-bit apps or different screen sizes on new devices – and we often have to react, because large and small incompatibilities can and do appear. Like a boat full of holes it gets harder to patch up again every year, so we had to make a decision to future proof our games at some point. We took the opportunity to upgrade the game’s appearance and functionality at the same time. We do believe we improved the game in many ways, but we were also aware that not everyone would like everything we changed. All is not lost necessarily. If you get in touch and give us more specific information about which features you preferred in the old version, we can take that into consideration for our next update. All our games are considered for updates and/or sequels and we are more than happy to pass on your thoughts to our design team. We are sorry to hear that you are unhappy with our game. I would like to assure you that the inclusion of new consumable in-app-purchases is entirely additive in nature. The game mechanics are in no way altered or tweaked to encourage sales. The rule set governing the game and the dealing of hands is entirely random and as such identical to older versions of the game. The new included options are designed to offer more choice to players without taking anything away. We will look into communicating this fact better and apologise if we have caused any upset. All our games are considered for updates and/or sequels and we will pass on your thoughts to our design team. We are sorry to hear that you are unhappy with our game. As part of our recent update we changed the way we ask people to rate our games from a standard iOS prompt, that pauses the game and requires a response, to a messaging board that in most cases does not stop the game and can be safely ignored. a) What we were hoping to achieve is to reach our customers in a more friendly and less intrusive manner than the standard approach used in many apps on the App Store, prioritising free choice over forced response. This may not have worked out as hoped, and we apologise for it. b) Your votes count! Without ratings and reviews our games are harder to find, which leads to less people playing which means we can invest less into upkeep and making more free games. We love we what we do and take a lot of care over it, but we are a small independent company and reliant on growing the community. Ratings are a crucial part of that. All our games are considered for updates and/or sequels and if you get in touch your thoughts will be heard. We are actively looking into refining the ratings process and hope to issue an update with tweaks in the near future.